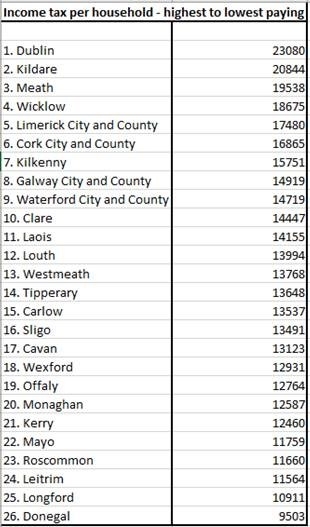 Home » News » Offaly ranks 19th in Income Tax League tables – would or should people in the region pay more? As a nation we would broadly be in favour of the introduction of a Wealth Tax, as evidenced by the results of the latest instalment of the Taxback.com Taxpayer Sentiment Survey Series 2018 (Appendix 1 below). The leading tax refund specialists asked 1,700 taxpayers throughout the country for their views on taxing public wealth. The survey uncovered that a “landslide” 65% agreed a new tax on accumulated wealth should be imposed. 61% of respondents concurred that a new higher ‘third’ rate of Income Tax should be introduced to gather additional taxes from those on larger incomes. To Flanagan the message the survey is delivering is crystal clear – “Tax the rich”. “The recent increase in property prices has meant that those who are on the ladder are seeing their net worth grow by 11% a year. In 2015, statistics from economist David McWilliams revealed that wealth is highly concentrated in this country – with 73% of the country’s wealth is owned by the most affluent 20%. It doesn’t matter if it’s those with high income or those with accumulated wealth that have already been taxed – our survey has indicated that two thirds of people want to tax it again. Balancing that, the top 1% of earners paid almost 25% of the income tax collected. The top 6% of income earners – those households with income over €100,000 per year - paid a staggering €11 billion in income tax in 2017. This figure is over half of the record high total of €22 Billion that was collected. Taxback.com report that in the Revenue’s annual Ready Reckoner for 2017, it was estimated that introducing a third rate of tax would generate an extra €140 million per percentage point – so a top rate of 45% would mean an extra €800 million for the Government coffers. Mr. Flanagan continued, “61% of our survey respondents said they would support this. While 42% believe it should only apply to income of over €100,000, and 71% say it should be introduced at a rate of between 41–50%. But those in power might balk at the idea of another income tax, given that Government policy is to reduce income taxes to avoid ’taxing work’, they may see the introduction of a Wealth Tax as being more palatable to the public. Quite how much this new Wealth Tax would reap would depend on the level of the tax. In the survey, taxpayers were found to favour a rate of between 1-5%. However, this rate would be considered very high by international standards, with those countries who have Wealth Taxes tending towards an annual charge of less than 1%”. “Anything in excess of 1% may lead to a ‘flight of capital’,” warned Flanagan. Mr Flanagan concluded “Perhaps it’s time we started this debate in earnest and start to compile the data”.